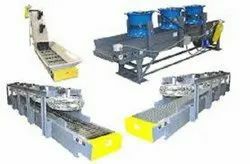 Offering you a complete choice of products which include cooling and drying conveyor. Cooling & Drying Conveyor significantly increases efficiencies in die casting. It eliminates mist in cooling hot die castings, and it replaces water quench and reduces cool down time. It's designed to interface with existing conveyor systems and is custom engineered from standard components. Looking for Cooling and Drying Conveyor ?